Trying to hook up a Faria tach on my 1975 1500inline 6 , set the pole switch on the back of the tach for a 6cyl but when I run the motor the rpms are about 1000 to hi , tried the fine tune screw on the back of the tach but no help , should I try different pole settings. 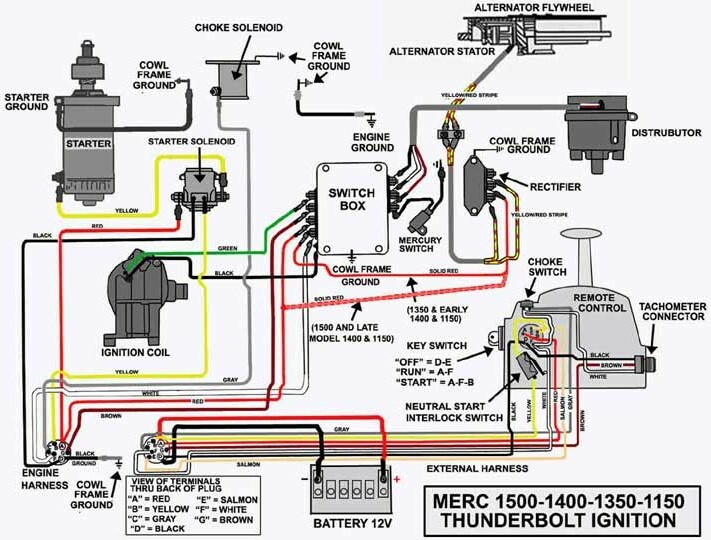 Check to make sure the tach sensing wire at the motor is connected to one of the yellow-wire stator terminals at the rectifier. Some of the older motors used a Merc "SS" tach which took its signal from the switchbox and this won't work on a tach meant for stator output. Should be a brown wire connected to the Stbd side of the switchbox, just move to the rectifier if that's the case. thanks Ed will give it a try tomorrow , two other questions witch of the tree terminals on the rectifier should I connect it to and do you know how many alternator poles there are on this motor ? Connect to either terminal on the rectifier where the yellow stator wires connect. It doesn't matter which one of those the tach wire hooks to. However, in no instance should the tach wire be connected to the +12V (red) terminal on the rectifier, it'll burn out the tach. If I recall correctly, the stator has 12 poles and you should turn the tach adjustment switch to the "6P" setting.